Mavericks is located off of Pillar Point, about 4 miles north of downtown Half Moon Bay in the town of Princeton-by-the-Sea. You won't find signs leading to the "hidden" spot, but friendly locals will direct you to the right place. Mavericks, the wave, breaks 1/2 mile offshore on a reef that remains tranquil most of the year but becomes alive in the winter when big winter storms come from the north and push enough water over the reef for a wave to form. If you visit in the spring, summer or early fall, you will find a peaceful beach with waves rolling in through the rocks and lapping at the shores. But come winter and the right swells, Mavericks comes alive, the beach is often underwater, and the rocks appear tiny in the face of the massive waves and whitewater that pounds the reef. It's probably one of the most frequestly asked questions any resident of Half Moon Bay and surrounding communities hear day after day. Knowing that Mavericks is a destination for travelers worldwide is often a sense of pride, although the traffic in this small town can be downright maddening. Come winter and when the swells are big, the area around Pillar Point Harbor can become as crowded as the lineups at Mavericks. The trek out to the closest beach (Pillar Point Beach) to the big wave spot is not an easy one. You cannot see the waves from the highway, and one would never know that some of the biggest waves in the world are just west of Highway 1 just by sight. 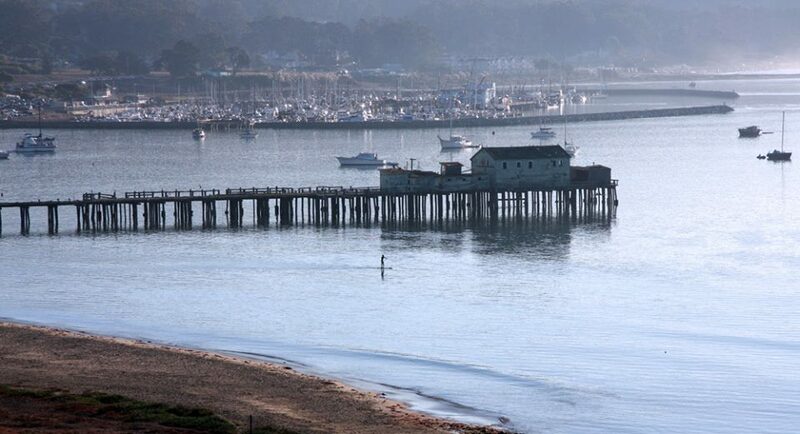 No, to discover Mavericks, you have to visit Princeton-by-the-Sea and the active fishing harbor at Pillar Point Harbor. There, you will find Mavericks Surf Shop and a slip for directions to the break. That's the easiest way to go. 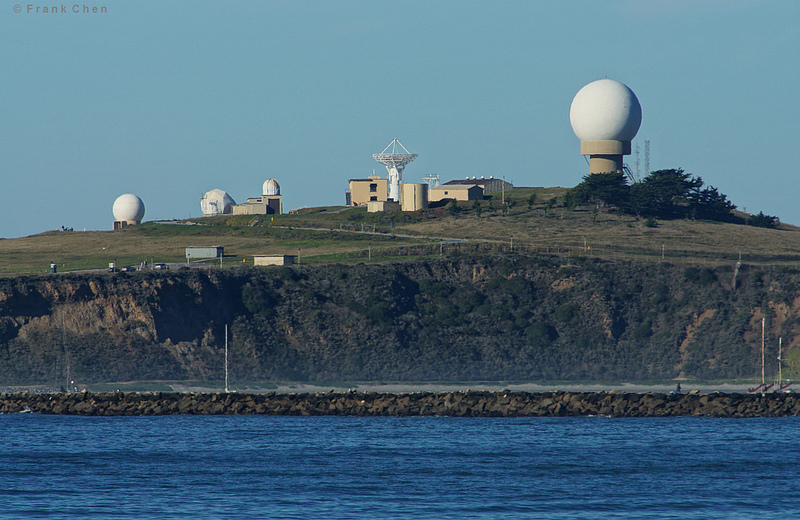 For those who wish to make the trek, look for the "Point" -- the bluffs just a bit northwest of the Harbor, with the looming radar station often referred to as the "giant golf ball on the hill." 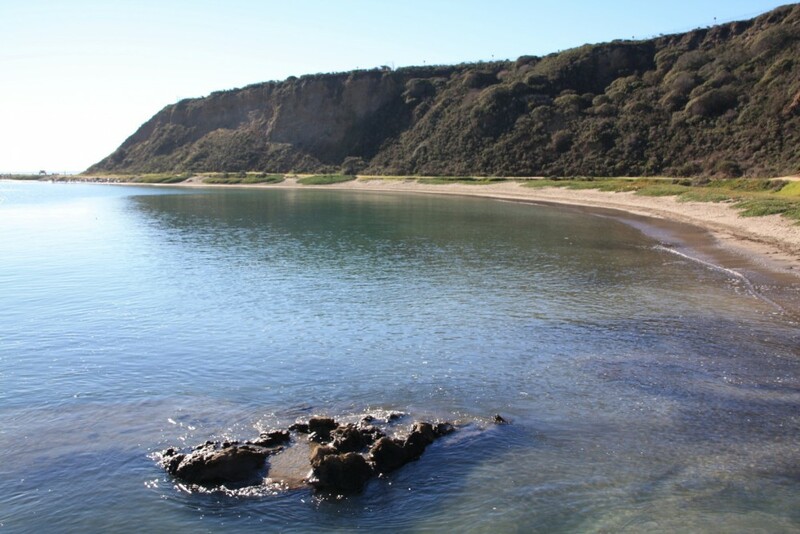 At the base of those bluffs lies the beach where surfers enter the water for the 1/2 mile paddle to the outer reef. 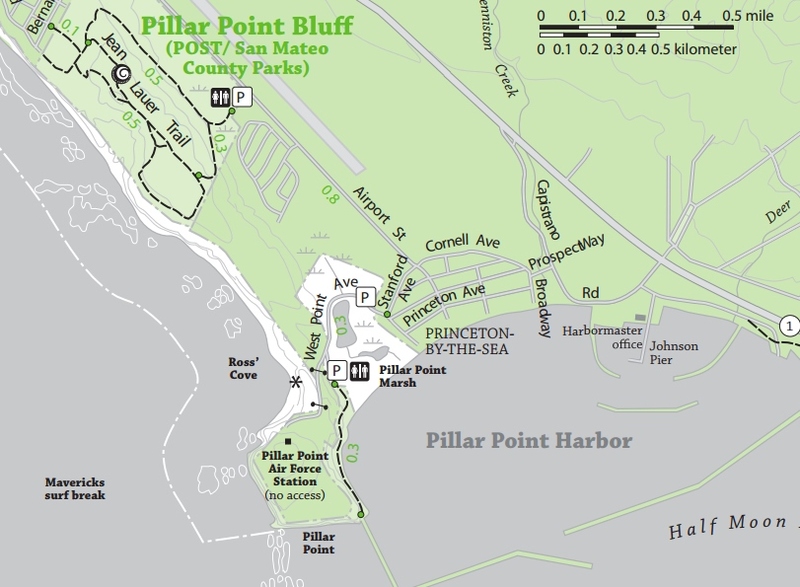 To get there, find your way to West Point In Princeton and follow the road to the small dirt parking lot at Pillar Point beach. You cannot drive to the top of the bluff, which is part of Vandenberg AFB and off limits. If you can find parking, then follow the dirt trail that follows the bluffs and water out to the beach, about a 1/2 mile walk. Once there, if the tide isn't too high, you can stand on the beach and strain to catch a glimpse of surfers out to sea. Binoculars help. And you can climb part of the eroding cliff to get a higher view -- but be warned, it is slippery and dangerous. NOTE: this area, including the beach and bluffs, is closed to the public on contest day. The eroding cliffs and high tide are too dangerous for crowds to gather. The harbor area is a popular spot for recreation and dog walking. The calm waters of the harbor are perfect for paddleboarding, kayaking and sailing as well. But just over the jetty walls lies some of the deadliest surf on the West Coast. As with all beaches facing the ocean, always be aware and never turn your back to the ocean.